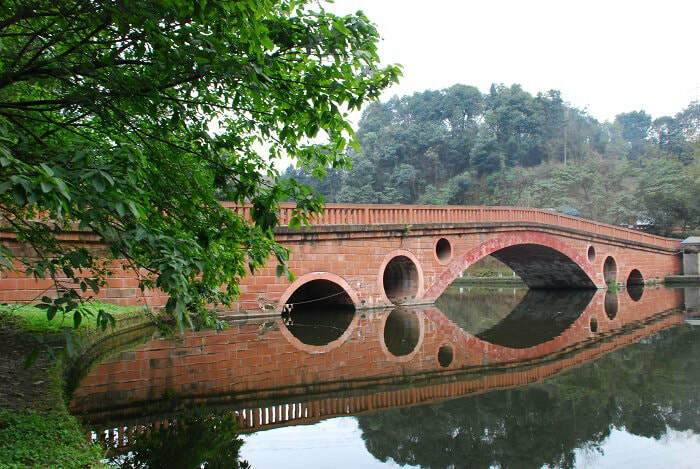 Situated in the heart of Leshan, Haitang Park is popular with locals.Cherry-apple trees grows across the park. In spring, they are perfect for photographing. In addition, lots of locals enjoy themselves in the park at any time around the year. Also known as Yu’erwan Park (渔咡湾公园), Haitang Park has been open to the public since May 2009. Visitors can appreciate beautiful cherry-apple trees from the early February to the early March. In addition, you can hike up the mountains in the park, and enjoy boating on the lake. Many locals like to sit and walk around the park to refresh themselves. You also can taste delicious local food in the park if interested. There are also some recreation facilities for children to play with. The best months to visit Wuhouci Temple is from March to May and from September to November as these months are not so cold or so hot. Wuhouci Temple is located in downtown Chengdu. Therefore, there are several options. Take Metro Line 3 to the Stop of the Gaosheng Bridge(高升桥站). And walk to the Entrance D. Out of the entrance, walk for about 10 minutes to the temple. Take a direct bus from Chengdu Shuangliu International Airport, Chengdu East Bus Station(成都东汽车客运站), Kuanzhai Ancient Street(宽窄巷子), Du Fu Cottage(杜甫草堂), Jinsha Archaeological Site(金沙遗址), Chunxi Pedestrian Street(春熙路), Dujiangyan Irrigation System(都江堰) and Sanxingdui Site(三星堆遗址) to the temple. Please be careful when enjoy boating on the lake. Please take care of your camera or cellphone on the boat. Interested in visiting Haitang Park on a Tour? Wendy Wei Tours offers a variety of different packaged tours as well as custom tours including Haitang Park, among other attractions and destinations. To find out more, please visit our Tours page or Contact Us directly to find out more.